What does the bride on a budget do after seeing the price of wedding mags and books? She goes to the library! 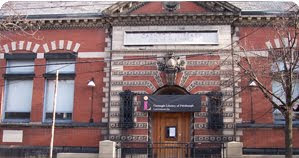 And what better way to support the local library by giving it business (Our libraries donated by Andrew Carnegie are by the people for the people free public libraries. They aren't government subsidized so they depend on donations, volunteers and other forms of support that include a little funding from the city. Sadly they are struggling and the library branch in Lawrenceville was to close this year... Luckily it got a year reprieve. And I just realized I ought to write a separate post about the library as this is already getting large... so stay reading for that...) At any rate... the cost conscious bride can go to the library and request books that would otherwise set her back more than $20 a piece. And as she won't be needing these wedding books in the future (one would assume she'd only marry once), borrowing is in her best interest! That's what this bride on a pauper's budget did after wanting to pick up a copy of the Paper Bride but couldn't afford to spend $25 on the book. Instead of ordering the book on Amazon and still spending money that I didn't have, I borrowed it from the library for free! Our local library can order in books to the smaller branches and if specific wedding periodicals are what I crave, then I can make a trip during lunch to the main branch in Oakland. It's quite ingenious as I don't see me needing wedding books after September and I currently don't have any family members that will be needing DIY wedding materials in the near future. Plus this way the money I would have spent on the book can be used towards wedding shoes or even the haircut I've been needing to get. =) And who can beat how GREEN borrowing a book is? Anybody else find the library to be a valuable resource that you don't use quite enough?